What guards the gateway to adventure? The desolate Ruined Guardhouse stands defiant against the ravages of time. This outpost was once the first line of defense for what lies beyond. The original residents are gone but new guests are holding down the fort and they don’t like company. More than just an evocative encounter, The Ruined Guardhouse contains a map-pack, a color creature token, a side-view illustration of the area along with full creature (the green shivs CR 1/2) and encounter write-up. 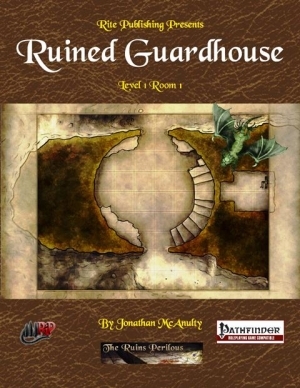 The Ruined Guardhouse is the first room of the first level of the modular mega-dungeon known as the Ruins Perilous, designed one room at a time as part of Rite Publishing’s ransom project. It is intended as an encounter for 4 1st level characters compatible with the Pathfinder Roleplaying Game. Get all of Rite Publishing’s Pathfinder products at RPGNow.com.